As the parents of three children ourselves we understand all about family holidays. We know what's important to you and we have made sure that all your family needs, from a safe and grassy play area to an exciting bunk bed to lots of indood and outdoor toys and games, are fully catered for. We have a BBQ with tools and a large outdoor table with six comfortable chairs. We also realise how things can inevitably get broken. All we ask is that you leave the caravan as you found it and either report or replace any breakages. We thank you for your co-operation in this matter and wish you and your family the very best of holidays! We request that a deposit of £75 is payable with your booking. We can do this easily using Paypal or, if you prefer, a cheque is fine. Unfortunately we cannot make refunds, so these monies, once paid, are not refundable. It may be helpful for you to consider taking out some form of holiday insurance. We also require a £50 security deposit which is payable with the balance. 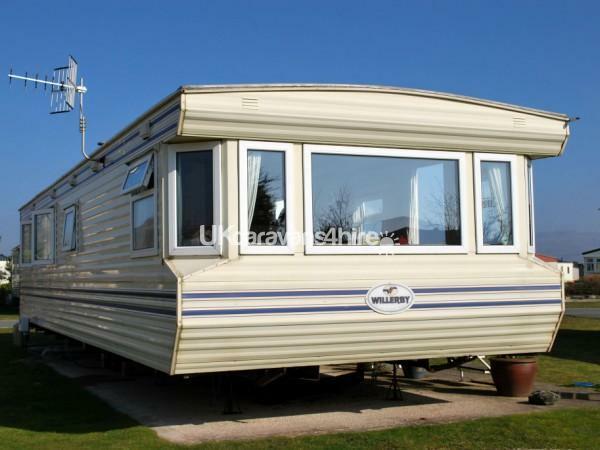 This will be refunded to you once the keys are returned and the caravan has been checked over. In the event of any damage a fair adjustment will be made to cover any breakages. This is a large 12ft wide, 6 berth, 3 bed Willerby Lorne luxury holiday home which is privately owned and fully equipped for your family holiday. We provide indoor and outdoor games and all you need for outdoor dining and BBQing including stainless BBQ and tools, large table and six chairs. Our caravan is situated on a safe and quiet cul-de-sac area of Greenacres Holiday Park, with large grassy play area, no through traffic and private parking. Just 5 minutes stroll from direct access to the beautiful and famous Black Rock Sands beach which, with it's acres of golden sand, dunes, rock pools and caves is always the main focus of most family holidays. 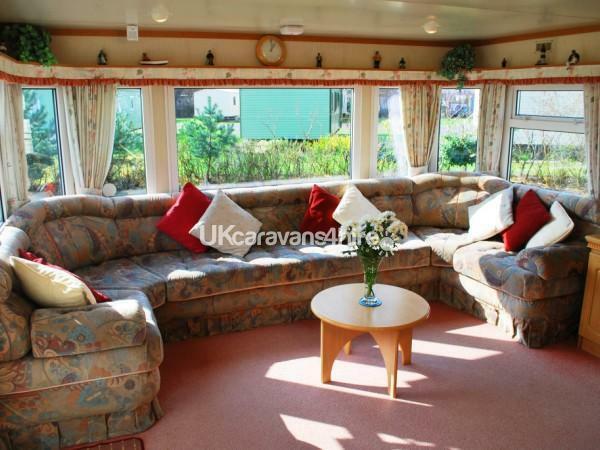 The caravan is 37ft long and 12ft wide you will find that the extra 2ft of width makes a world of difference to the useable feel of the caravan giving a feeling of spaciousness completely missing in the narrower examples. The lounge area is fully fitted out with lovely upholstered fitted seating. There is a flat screen TV with DVD player and DVDs as well as a CD player and CDs. There are books, games and maps, torch, First Aid kit and cooling fan. The separate dining area has fitted seating, stools and an oval dining table. 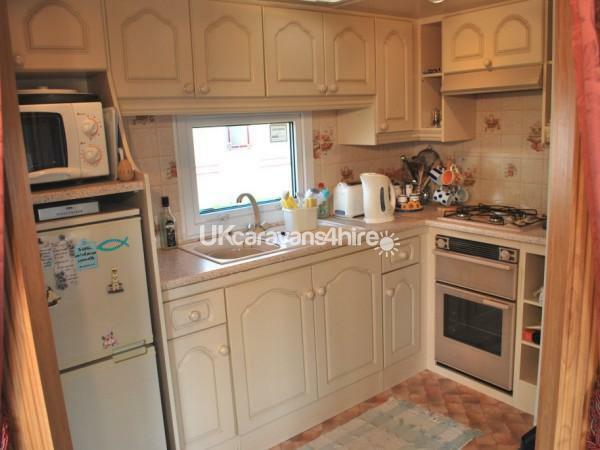 The kitchen is fully equipped for the preparation of family meals, has a fire extinguisher and can be separated from the lounge/dining areas by a curtain. There are three bedrooms: The master with double bed has en-suite access to the shower/wash room. The 2nd bedroom has two single beds whilst the 3rd has a single bed and a medium level bunk bed which all children are sure to find exciting! There is a separate room for the WC and wash basin. We have a gas fire, ceiling heating panels, heated towel rail and full double glazing as underfloor insulation to keep you all cosy. Outside there are six chairs, a large table and a BBQ. We provide pillows and duvets for six persons but you will need to supply your own linen. We organised a late weekend break in May, as the thought of camping in this unseasonal weather did not appeal very much! I spent my time ringing a few private owners on Greenacres and I must say Chris was the most helpful with my last minute request. The Website is very clearly set out and the pictures are very true to what is the reality when you arrive. Chris has arranged payment through Paypal, which gives you reassurance and feels like a professional way of paying. All email communication was precise and I felt confident that we could set off for our weekend break. When we arrived at Gul court we were delighted as it is in a quiet cul-de-sac with lots of space around the van ( unlike some pitches!). It also had tarmacked carparking spaces, which cannot be said for other areas of the site. The caravan is very much home from home, and because it has been loved by the family that own it comes with everything you could possibly need for a comfortable stay. 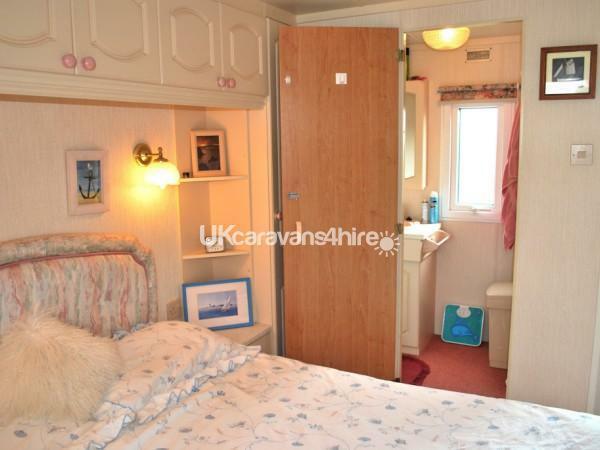 I really cannot think of any down side to this caravan, yes it is not as new and sparkly as some on the site, but I think this generation of van are more comfortable and also in better locations on the site.The very first thing I noticed was how immaculately clean it was. It really is 2 minutes walk from the beach, which is the huge benefit when you have children. I highly recommend Chris and Karen?s caravan to hire, as they provide great customer service and a great value holiday. as a general rule the wife and I choose not to leave reviews,this is different!EVERYTHING about our weeks stay filled us with such joy:caravan and amenities are excellent,indeed every need seems to have been catered for. The caravan has a very friendly feel about it:Christopher and Karen have put a lot of themselves into it:warm and friendly.you feel quite relaxed almost immediately.The caravan is in a unique spot(gul court)the beach is a very short walk away,its beauty must be seen to be believed.Because of the friendliness,the great amenities,great location and very fine beach,and of course how very very much we enjoyed ourselves,we felt we had to share our enjoyment with you. GREENACRES HOLIDAY PARK is part of the Haven Holidays group and, as such, boasts all of the amenities which you would expect. There is a large complex comprising the reception area, convenience store, indoor soft play area, arcade, a large indoor swimming pool plus toddler's splash pool both with life guards, lounge bar and cafe/restaurant all licensed and a large Showbar featuring varied live entertainment. Outside there are children's play areas, a multi-sports court, family adventure golf, water splash area and family seating. Elsewhere on park there is an archery range, a hire shop with bikes/karts and a launderette. There is a Children's Fun Club with a daily range of supervised entertainment and activities. The park also has it's own nature reserve and there are regular bus services to Porthmadog and elsewhere. Passes for the above can be purchased at reasonable cost from the Greenacres reception area and linen can be hired if booked prior to arrival. There is much to do in the area with a local pub, PO, Spar shop, quad bikes, Llama trekking and a superb links golf course all within 1 mile of the caravan. Porthmadog, home to the world famous Ffestiniog narrow guage steam railway, is less than three miles away and has four large supermarkets, a bustling High Street and a beautiful harbour as well as many pubs and restaurants. As parents of three children ouselves we know what makes a great family holiday and we know that you and your family will love our caravan, the park it's on and the area surrounding Greenacres Holiday Park. Karen and Chris Tombs wish you and your family the very best of holidays. Recently come back from a stay at Greenacres and couldn't fault the service from start to finish. Booking was easy from faultless communication and information received following the booking. From arriving at the caravan, it was spotless and in an excellent location on a cul de sac where the kids enjoyed playing on the grass outside. Also available were numerous games and beach stuff, which again the kids had a great time using at the beach. If I was to return to Greenacres I would definately be booking again with Chris and Karen. Thanks for a great holiday. We enjoyed such a lovely time during our stay at Chris and Karen's caravan felt a review was warranted. As previously alluded to all the amenities you could wish for are available in the spacious lovely home from home caravan. The caravan is located in a quiet cul-de-sac part of Greenacres, indeed during our weeks stay there was only one other property occupied. A holiday of two halves as we had two little companions for the first 3 nights! They were really sad to be returned to Chester such was how much they enjoyed the caravan and the amenities of Haven's entertainment complex. They also loved the beach and the dunes just 5 mins walk from the van. After they the little ones departed we were able to get out and enjoy the wonderful scenery this gorgeous part of West Wales has to offer: a lovely drive to Barmouth one day, nearby Cricceth another, a lot of time spent in nearby Borth y Gest on several days. Loved lingering there as the place evokes so many memories of childhood summer holidays at my Grandmother's house. A real hidden gem of a village with beautiful beaches around the headland, don't miss a trip there! So much else to enjoy that we never got round to, train trips, exploring the lovely Llyn peninsula, Port Merion etc etc, that will be for another time, indeed we have booked again!! Chris and Karen so friendly and informative when it came to booking, as previously reported communication spot-on.Thanks to them for a cracking week. Bendigedig!! We are grandparents and we booked a holiday for our grandsons (aged 10 & 6) and my sister. We have not booked anything privately before and did not know what to expect. Chris and Karen made the process extremely easy with excellent communication. 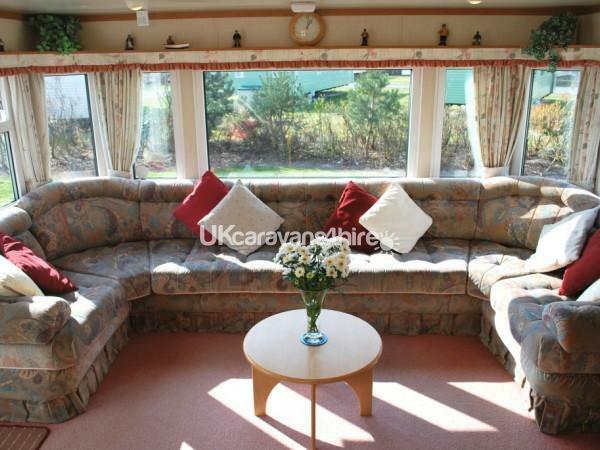 The caravan (although not new) is very homely and we'll equipped, we felt at ease as soon as we arrived. Everything that has been said previously is correct and is highly recommended. Had a great weekend with family just wish we could have stayed longer, lovely van, site and surroundings. Great communication with Chris and Karen they could not have done any more, caravan had everything needed was like home from home. Booking for a week next year! 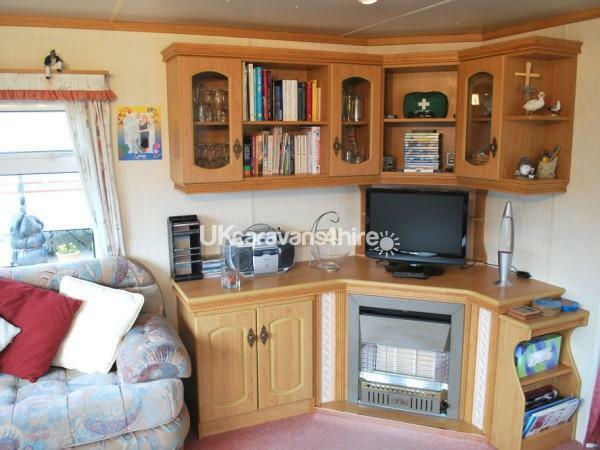 A lovely, homely caravan in a spacious and private spot. Clean and well laid out, our little one loved the bunk bed! Booking was straight forward and the owners friendly and accommodating. Thanks again Chris and Karen, we will most certainly be booking again ?? First off I would like to say how much I appreciated Chris's attention to communication throughout the whole booking process and again after our holiday with the prompt repayment of our deposit, many thanks Chris. As for the caravan itself, no complaints at all considering what we paid, very comfortable and very well kitted out with everything you could possibly need on a holiday, we've been on a lot of self catering holidays and none were as well equipped as this one was, it felt like a family holiday home instead of an empty base to sleep and eat. The van is sited in a very quiet little cul-de-sac with lots of space around it for the kids to safely play and is within 5 minutes walk to the outstanding Black Rock sands beach and also a couple of minutes walk to the main Haven complex too. Overall we had a great holiday here and wish we had booked for longer. 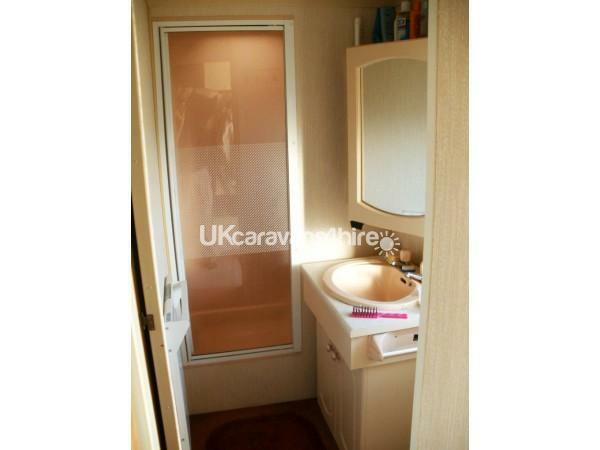 We would have no hesitation in recommending this caravan to anyone and using it ourselves again in the future. Having just returned from my week away with my 5 year old grandson and 3 year old granddaughter, I felt that I should write in praise of the static van and the site as a whole. The van had everything that we could wish for on a self catering holiday and was very well laid out. The fact that the shower base could be used as a child sized bath was a real bonus for my little ones. The site overall was immaculately maintained, and the entertainment pass was a real boon as I managed to pick the worst weather this summer to stay. The swimming pools were brilliant, as were all of the kiddy shows. The beach is very near and easily approached. Miles of sand and dunes to play on. Loads of places within half hour drive as extra entertainment. Chris's communication throughout the booking process was outstanding. Hope to bring the little folk again next year. Great service and in a quiet part of the park. Coming back this year. we have had the pleasure of staying at Karen and Chris's caravan 2 times now, and have had a wonderful stay. 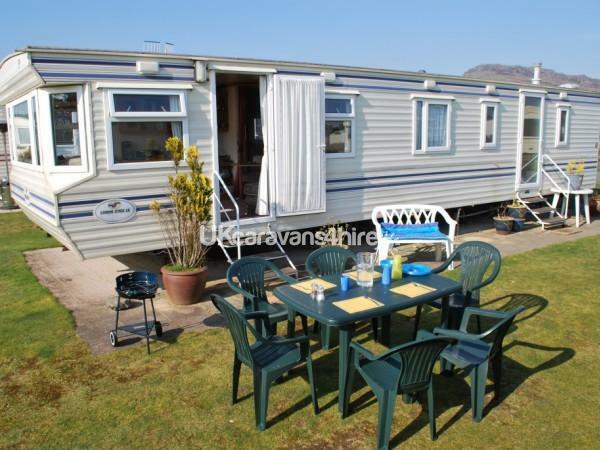 the caravan is on a more established part of the site, which have larger plots and nicer situations. 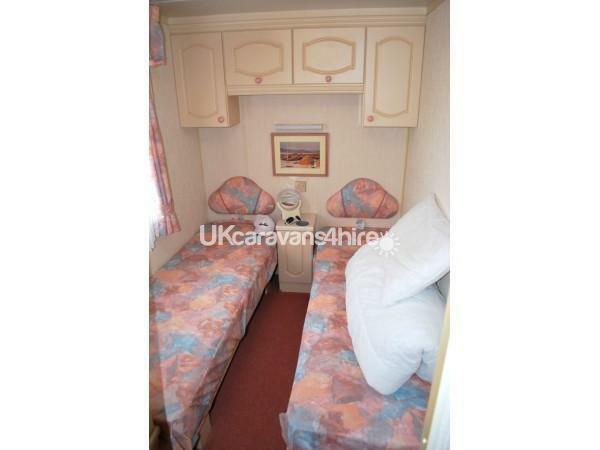 of course there are newer caravans on the site, however this one comes with all the equipment you need for a family holiday. with samll children you need the creature comforts and this van certianly provides it. we bought a week pass to the leisure facilities which is worth it when you have young kids as they loved the shows etc. The beach is stunning and this caravn is well placed to access it. karen and Chris are very haelpful with your booking and their customer service is fantastic, and communication fantastic. we will certainly be looking to go again. I just want to say that Karen and Chris were really helpful and kind knowing what i had been going through last year. 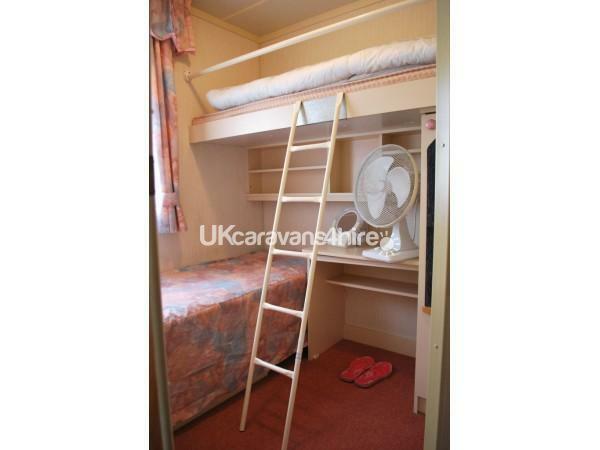 There caravan was lovely and spacious, big enough for my now grown up children. It was clean through out with all the kitchen utensils you could possibly need. Everything was catered for including dvds and books. You are only a short walk away from the beach, with some beautiful views. I have been going to this site for many years, so have seen many changes all which have been for the good. I would just like to say a big thankyou again for a great stay. The caravan was value for money going off last years prices. The family were lovely and were available to contact any time and responded quickly to any questions. This was the first year we stayed in a caravan and we are going back again! It was situated in a nice spot that was central. Ive been to this site several times with my young daughter several times, and stopped in this caravan on two occasions. The caravan itself really is home from home. It has everything that you could possibly need on a short weekend break to a fortnights stay. It was spotlessly clean on arrival. All the kitchen wear were also extremely clean. Someone obviously takes a lot of pride of there caravan. Although there were only my daughter and myself rattling around this big caravan, it would easily accommodate a larger family without the feeling of being on top of each other. The site itself is really a great base for exploring the surrounding area and if you stay on site there is plenty to do, not forgetting Black Rock Sands that can be accessed through the site. I can not pick fault with the sire nor the accommodation. It is truly a great place to stay, and Karen and Chris are truly kind and helpful people. Book your break with them and you'll have a great stay. We found the caravan to be in a good working order, clean and very comfortable with everything we needed to be able to cook all of our own food. My girls adored the personal touches and some of the DVDs; it made it feel very homely. The heating system could have been more modern but it did not affect us that much and we were at the end of October. The facilities on site are good but we were a little disappointed that Haven did not let us use the facilities for one off things like swimming etc. The location of the caravan on the site is very good as it is in a quiet spot, very close to the access to the beach which is wonderful. Also the caravan park is within easy driving distance of some of the most lovely spots in north Wales. We would certainly revisit.